Any good Washington, DC, wedding photographer knows that composition can mean the difference between so-so and unforgettable images. What the photographer includes in the frame and what they leave out literally makes or breaks a shot. That decision is probably the most important one in the photo-taking process at a Washington-area marriage celebration. Yes, the exposure levels and aperture matter. But there is a lot that can be done to fix any problems in those areas in post-processing. A substandard composition, however, is much harder to address. If a critical element is not present in the frame, there is nothing the photographer can do about it later. If the bride is shedding a tear but we cannot see her face, then that precious moment is lost forever. 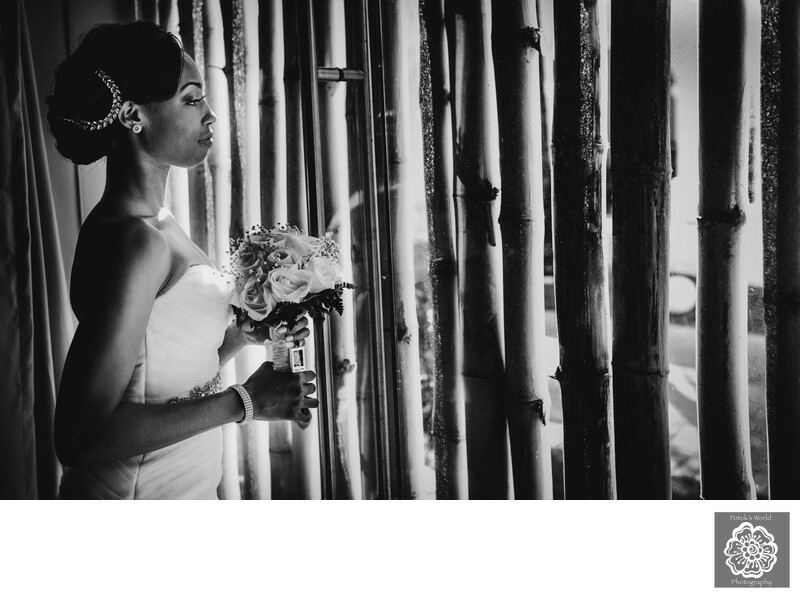 For documentary DC wedding photographers like us, effective composition is even more crucial. Every photograph that we take at a wedding is meant to tell a story. Someone who was not at the nuptials should be able to understand the significance of an image without any additional explanation. What is happening in that moment and why it matters to the Washington-area newlyweds should be immediately obvious. For that to happen, the story needs to be concise. There should be enough information in the picture for the viewer to grasp what is going on. In addition to the principal subjects, there should also be other elements that give the context of the moment. The aforementioned image of a bride crying is not impactful if it is not clear where she is or why she weeps. At the same time, a well-composed photograph should not have too many extra elements. Anything beyond what is needed for context is likely to distract the viewer’s eye. An image should be as clean as possible and not cluttered with extraneous details. Good DC wedding photographers use positioning and lens choice to eliminate anything that interferes with the purity of the story. Photographs of moments should be wide-angle only when an expansive perspective is a critical to understanding the happenings. If that is not the case, then a tighter shot is almost always a better option. The picture we have posted here demonstrates that point very well. 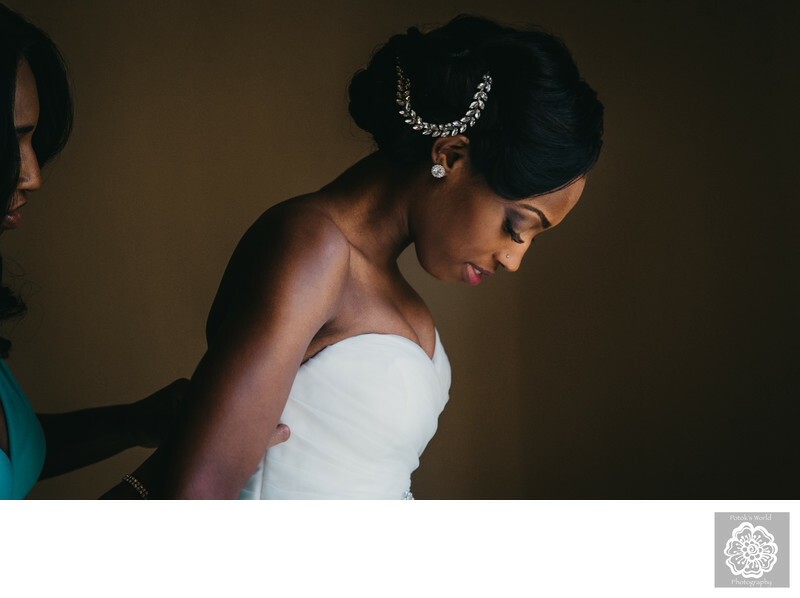 It shows how a Washington, DC, wedding photographer can tell a moment’s story effectively with a simple composition. There are literally only two people in the shot: the bride and her bridesmaid. They are standing in front of a blank brown background. There are no other elements in the frame — just the people. They are the entire story, and there is nothing to pull the eye from them. You cannot help but look at them. Despite this relative lack of information, though, it is easy to tell what is going on in that moment. You can see from the bridesmaid’s hand and face that she is getting the bride into the latter’s wedding dress. That is also clear from the slight tension in the bride’s body. She is obviously tensing to provide resistance against the tugging of the bridesmaid. At the same time, the look on her face shows that she is feeling serene and relaxed. She is not stressed about her wedding or any of the getting-ready process. The bride is just enjoying the moment and eagerly anticipating her upcoming nuptials. We took this particular picture at a destination wedding in the Dominican Republic. The bride and groom brought a select group of family and friends to the Now Larimar Resort in Punta Cana. After spending a few days enjoying everything the all-inclusive hotel had to offer, they tied the knot in a gorgeous outdoor ceremony by the resort’s fountain. They and their guests then moved to the beach for a rollicking celebration of the nuptials. The group danced and sang deep into the night in one of the funnest wedding receptions we have ever attended. They capped off the event with a beautiful sparkler exit before returning to a honeymoon suite that the wedding party had decorated as a surprise. It was definitely a destination wedding that was worth leaving the DC metro area for! As a site note, we had the pleasure to collaborate with the Washington-based Andrias Events on this beautiful wedding. We loved working with their first-rate staff! Location: Now Larimar Resort, S/N El Cortecito, Avenida Alemania, Punta Cana 23000, Dominican Republic .